Heck, they even installed lights recently under Pretoria Bridge for those who are afraid of the dark! One household on Florence has done a great job decorating their yard for Hallowe'en. Here's a day shot, so you can see what's going on (as always, click a photo to view full size). The inflated ghost has a clear stomach with little bats flying around a black cat. Very cute! I'll be out around Centretown and haunting the Glebe tonight. Have a Happy and fun Hallowe'en! Organic (vegan optional) Pizza comes to Centretown! At the family Thanksgiving dinner, one of my quasi-relatives exhorted the availability of vegan pizza at the pizza place on Kent and Florence, across from the new Chinese community centre. I recognized the place that she was referring to, but I didn't realize that it had changed from the former tenant, Paesano's Pizza. It wasn't until a walk about Centretown last night that I realized it was a new place--"The Place". I went inside to pick up a menu and found a familiar face. I chatted with the owner, an ardent supporter of small business. The Place has been open for a month and three days, and they don't have delivery yet. They also have pizza by the slice at luch hour, though my office is a bit far from there to try it out. I have a regular Sunday dinner, so I didn't have a chance to try The Place's pizza, but I will do so to support organic options, and to support small business in Centretown! The first piece of street furniture has been installed on Bank Street between Laurier and Somerset, and it inspired me to finally post some photos of the construction. I've managed to pare down my 325 photos of this phase to 18 for this post. I definitely have a sufficient variety of photos for more follow-up posts. Anyway, the reason I was inspired to post was because this particular piece of street furniture--a bench--is particularly disgusting. It is possible (though not likely) that this will be replaced by the comprehensive street furniture project (unlikely because the street furniture for this project was developed for Bank Street specifically). Anyway, on to the photos from the construction. 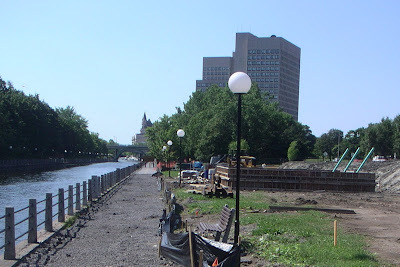 First is a mostly "before" picture from early June looking North from Bank and Lisgar. We can see what Bank Street used to look like, how wide and decrepit the sidewalks were. Next is a shot of Bank and Somerset after the big hole in the ground was paved over and painted. The sky still had some light in it at 9:30 pm. My how the seasons change quickly! In early August, they had finished with the centre of the road and moved on to work on the sidewalks. But to maintain access to the stores, fenced walkways were erected at each entrance. It looked a bit of an obstacle course, but really the wide central vista made for a rather enjoyable pedestrian walkway. At 1pm on a weekday in mid-September, the sidewalk was quite bustling between Laurier and Gloucester, while construction workers use the temporarily-paved road to park their vehicles. Good thing the rebuilt Bank Street has wider sidewalks! Pipes stick out from the middle of the hole at Lisgar on the same day. In order to collect the drainage from the basements of the surrounding buildings, the pipes must go pretty deep! Here's what the mostly-finished sidewalks look like today between Lisgar and Nepean. They're much wider and less cluttered than before! As much as I enjoy construction, and enjoy a car-free Bank Street, it will be nice for this section to reopen and see the next stretch get rebuilt! Which reminds me: a gratuitous 19th photo--they've patched some of the worst spots on Bank Street between Gladstone and James. I've already sent a thank-you note to the City for patching this stretch I navigate every morning! Drumbent tipped me off to this 1965 Buster Keaton clip of "The Railrodder" (sic--think "hot rod"). In clip 2 of the film, Buster is seen riding his rail car along the Rideau Canal, under the Laurier bridge, toward Union Station and past Parliament Hill. Exciting to see what it was like before it all got paved over! Will rail ever make a comeback, I wonder? I picked up a small flyer for the Centretown Free Market, happening this Sunday, October 5, 2008, 11am-4pm at Minto Park, and I see a poster for it in the Bridgehead where I am writing this post. Both have really nice designs, but unfortunately the website (centretownfreemarket.wordpress.com) doesn't have either. I lived a half a block away from Minto Park for a year, and one of my roommates thought the park's name was bought by Minto Group, the development company that built the gigantic tower near Westboro bus station. But I believe it was actually named after Governor General Minto. I enjoy going to the park in the summer to eat my lunch and get away from my over-air-conditioned office. Only a couple of spots on the park benches and picnic tables are in the sun. It was a Lady Dive tour bus, apparently being readied to be towed. One thing that struck me, though, was the very small amount of clearance between the rear bumper and the pavement. I was really curious as to how seriously they were planning on towing the thing.